We were once more invited by Françoise McCredie to hold our meeting at her residence. This was our last meeting of the year. 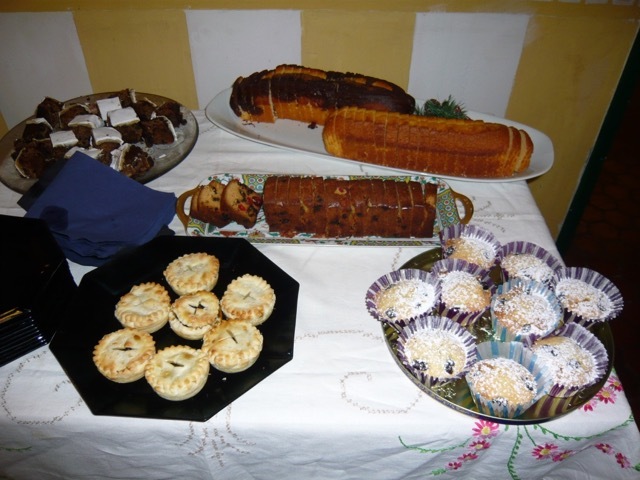 Françoise made Christmas Cake and several other cakes, June Lynn made Almond Muffins and Sue Mincemeat Pies, all of them delicious. 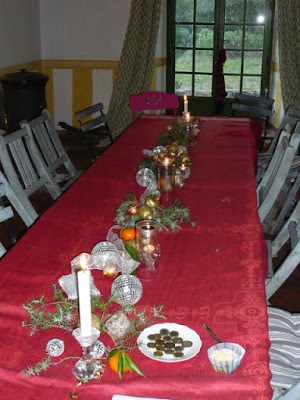 The table was decorated for Christmas, it was a lovely afternoon. We started the afternoon with pruning what we thought was a climbing rose, it was not vigorous enough for a rambler. The best time to prune a climbing rose is in autumn to avoid damage to the branches by winter winds. Normally a climbing rose is sold with several strong, long shoots. These should not be pruned till they have reached their allotted space. What should be pruned each autumn are the side branches that grow off the main shoots to 2 or 10 buds. It was a bit difficult deciding what to prune as this rose had been neglected for many years, we'll have a better idea next year. 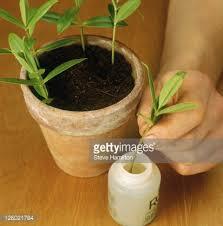 The main subject was how to plant up a pot with several layers of bulbs. The height of the pot used was 33 cm with a width of 35 cm. A plastic pot was used, a clay pot would have been better, but would have been to difficult to move afterwards filled with earth and bulbs. 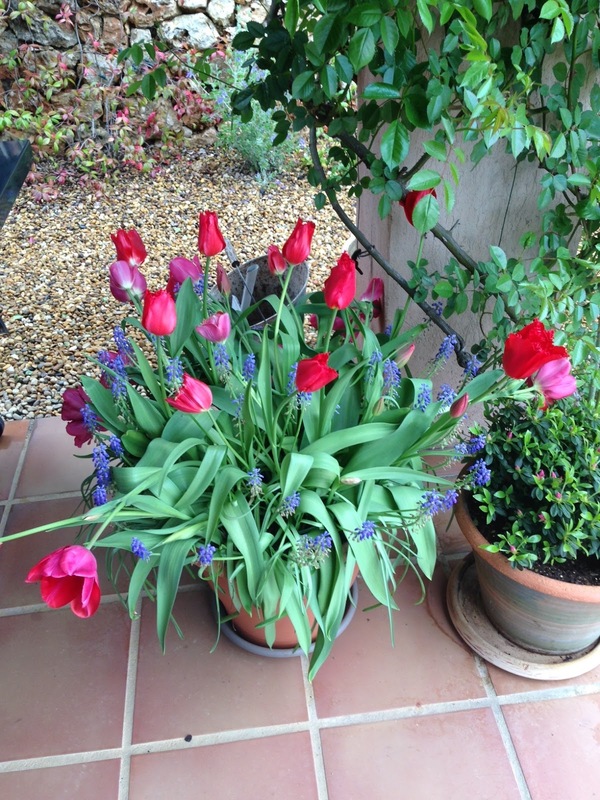 Bulbs in a plastic pot are more susceptible to frost damage. The bottom of the pot was filled with crocks. A compost specifically for plants in pots was used bought at Gamm Vert together with some handfuls of vermiculite mixed in. The pot was filled with earth to 20 cm below the rim. The first layer consisted of 20 bulbs of late flowering tulips. They can be packed in quite close together but should not be touching. A tulip has a flat side and a curved side. The flat side should be facing outwards. 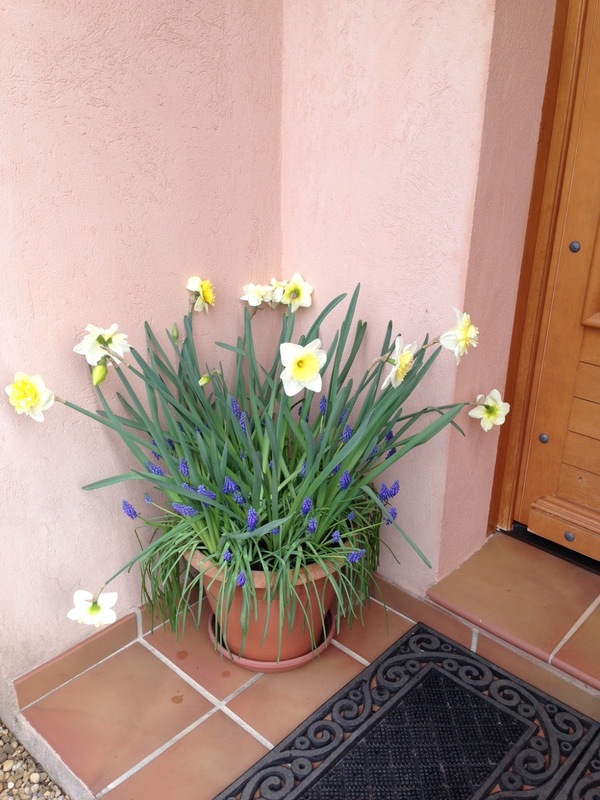 The bulbs were covered with earth, + an extra 2 cm of additional earth. Ready for the next layer. Again 20 bulbs of early or middle season flowering tulips were put in, just as mentioned above, again covered with earth + an extra 2 cm of additional earth. Next a layer of 40 Muscari, again covered by earth till just below the rim. 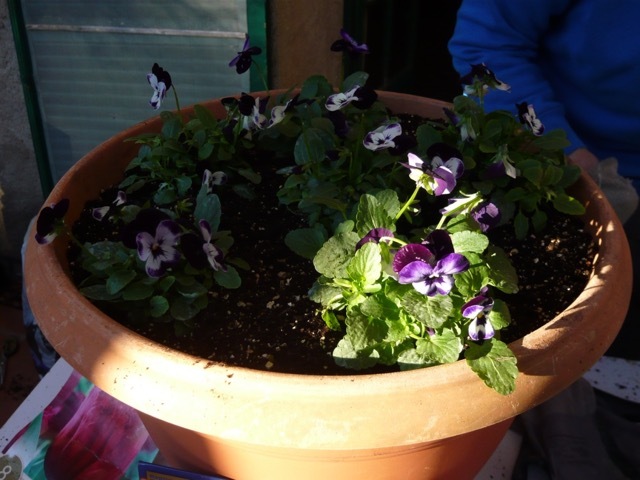 The last layer to put in were 6 small flowering pansies to make the pot more attractive during the winter months. Water in well. Depending on the weather the compost in the pot should not dry out. 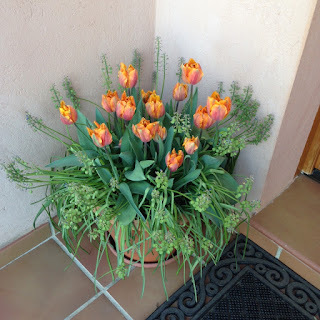 The bulbs inside the pot must not freeze, so during the winter cover the pot with bubble wrap or place it in a frost free area. 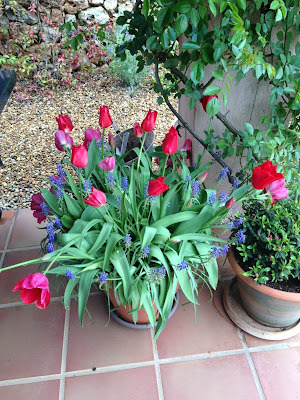 I planted up 1 pots with Narcissi and Muscari and the other with two different types of red Tulips and Mascara. For our October garden group meeting we thought to go back to some basic gardening techniques. Françoise has just bought a house on a large estate very near Monastère St. Joseph in Cotignac. The garden has been very neglected over the last few years, all plants are overgrown, so a wonderful place for us to practice our gardening skills. As our first project we decided to plant some trees. Françoise had two plum trees that needed planting. We decided to dig the holes a few days before the garden group meeting as digging holes here in the Var can bring some surprises. The first hole went fairly easy. Gabrielle advised to keep the grass we dug up and the good earth just underneath the grass to one side, to use later on. The soil looked like sand, but it turned out to be sandy loam, not very fertile. We dug a hole double the width of the pot and slightly deeper than the pot that contained the plum. The second hole was the problem, we were blocked by a large stone. We just had to manoeuvre the stone out of the way. Easier said then done. In the end it became a team effort. Sue, always so practical, found a metal stake and whilst we were trying to lift the stone with our pickaxes, she managed to place the stake under the stone. We heaved again with the pickaxes and placed some stones underneath the large stone, in this fashion we slowly raised the boulder. We continued till we finally managed to get it out and what a large stone it turned out to be. At the meeting Gabrielle showed us 2 pots, one filled just with earth, the other filled with a mixture of earth and stones. Both pots received the same amount of water. In the pot where there was just earth, the water drained away very quickly, in the other pot with a mixture of stones and earth the water stayed in the pot much longer. Whenever we try and plant something in our area, invariably we come across stones. Most of us remove the stones and use just the earth. That is exactly what we must not do, when filling up after planting something, the soil should have stones and earth in it. In our hot summer climate when we water we need the water to stay around the plant as long as possible and to achieve this a mixture of stones and earth is the answer. We filled up the hole with water. We waited before planting till the water drained away. As the soil was so poor, Gabrielle suggested to use leaf mold to improve the structure of the soil. Followed by a layer of compost. Followed by more compost and some stones. 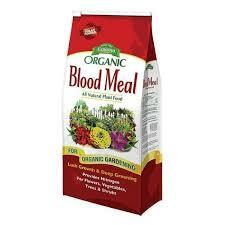 Followed by a handful of dried blood and a handful of bone meal. More compost, original soil that we kept aside, stones and Gabrielle's home made compost till the tree was planted at the right depth. To give it an extra boost several handfuls of sheep manure were spread around the tree. The grass we had put aside was then put around the tree to give it a natural look. More water was given to the tree. After the tree planting Gabrielle showed what she normally does when rejuvenating a very old, shabby oleander. She cut it down to about a foot away from the earth. 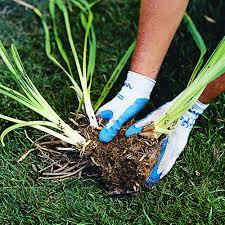 Weeds and rubbish need to be cleared from between the stalks and any weak shoot must be removed. 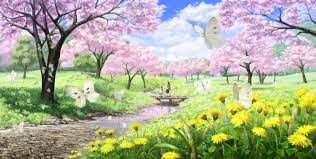 In spring it will sprout again. Just as we were finishing the rain came down. 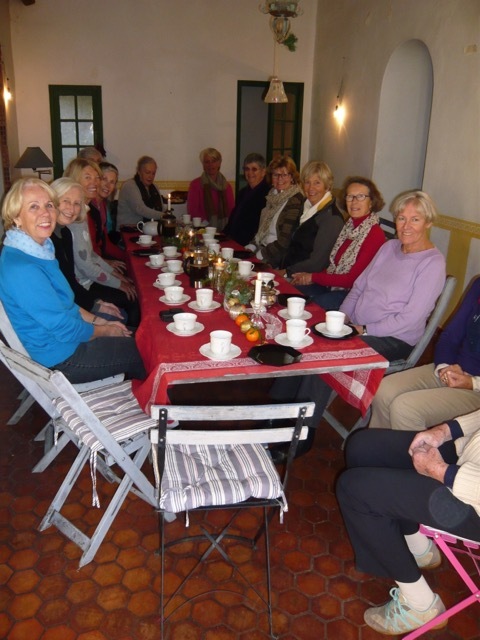 We retired to the warmth of Françoise's kitchen and living room where she had lit two fires. Enough room at the table for all of us to sit down. It was lovely warm and cozy. We were treated to a variety of cakes, biscuits, coffee and tea. Rini & Frans Rubbens were our hosts for this 'pot luck lunch', our usual way of starting the autumn season for the garden group. The house and gardens are impressive, with a huge terrace, big enough to hold 27 members. A waterfall completes the picture. Their gardener is an expert on pruning olive trees into 'clouds'. 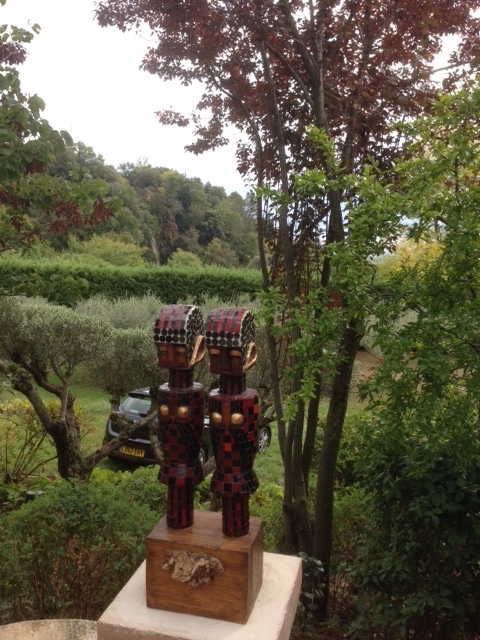 Rini makes mosaics sculptures, her own and sculptures of other artists are everywhere in the garden as well as inside the house. As usual Jacqueline Hodkinson sorted out the dishes everyone should bring. Quite an impressive sight seeing several quiches, salads, chicken dish, terrine, cheeses and desserts displayed on the kitchen table. 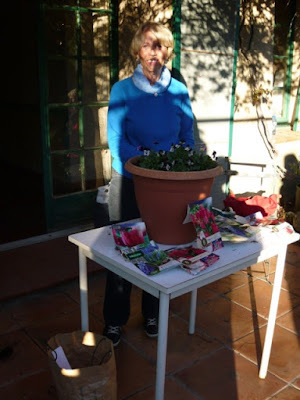 Mavis McQuade gave us a talk on how to propagate. She is quite an expert on it, her garden is full of small pots with cuttings in them. Making new plants for little cost is very satisfying either from ones own plants or from friends gardens or from the wild. Never go anywhere without a plastic bag in ones pocket! However one does need patience. It does not always work and it takes time for a little side shoot to turn into a good sized shrub. It makes one realise why plants can be quite expensive to buy. Today I thought I would go over on how to take stem cuttings as there is still time before the plants prepare for the winter. Soft or tip cuttings - these are done in spring or early summer using only the young soft growth at the end of a new stem, usually of perennial flowers and small shrub such as Salvia, Geraniums, Fuchsias and Caryopteris. These are the quickest to root. The second one, semi-ripe cuttings taken from current season growth that has started to harden off a little and are taken in late summer to early autumn so can still be made now. They are made by taking a heel cutting or a node cutting which I will explain in a moment. These cuttings root more slowly and need more protection. The third type of cuttings are hardwood cuttings. These cuttings afford the simplest means of propagation and are taken from October to March whilst the plants are leafless and in a dormant state and are inserted into open ground and may take 12 months to root. They need less protection other than good drainage. Always take cuttings from a healthy stock plant. If the plant is weak or has a disease or deficiency this will be passed on to its offspring and chances of survival and health are lessened. 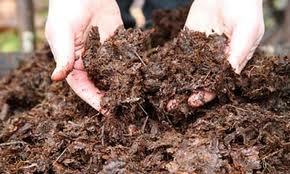 Choose the right potting compost suitable for 'boutures' - this can be bought in garden centres or Agro-Coop. It is best mixed with 50% grit, coarse sand, perlite or vermiculite. Hard to come by here. The soil should be moist. Try to take cuttings early morning when the stems are full of water. 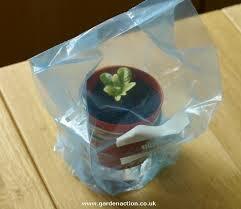 Place cuttings straight away in a plastic bag and pot up quickly. If I do not have time I often leave the cuttings overnight in a glass of water. Use clean, sharp-edged secateurs or knife. Best to take non-flowering stems though, bud tips can be removed. The size of the cutting is governed by the size of the plant. Small plants usually 10-15 cm, shrubs 15-20 cm. Besides compost, secateurs/knife, pots you will need a clear plastic bag and rubber band to go over the pot, and also some hormone rooting power. Take the stem you have a chosen and make a clean cut directly below the lowest pair of leaves. Remove these leaves and the next 2 pairs of leaves. When the cuttings are in the pot no leaves should touch the soil because they will go mouldy. Dip the cut stem in rooting powder or liquid hormone rooting. With a dibber or pencil make a small hole between the soil and the edge of the pot your have filled with compost and put in the cutting firming the moist soil around it. Depending on the size of the pot several cuttings can go in one pot. Place a name label in the pot. Spray with water lightly and place in a propagator or failing this cover with a clear plastic bag held on by a rubber band. Heel cuttings are the same procedure except the chosen stem is gently torn from the main stem and the resulting heel is lightly trimmed and the above method of potting followed. This method is used more for shrubs and conifers, heathers, rosemary etc. The pots need to be kept warm and light but out of direct sunshine. For the first 3 to 4 weeks the bag should be taken off the pots every couple of days for an hour or so to let fresh air circulate around the plant. After a few weeks when the cuttings show new leaves or are firm when gently tugged they are ready for potting on into individual pots. From then on one should nip out the tips of new growth to encourage the plant to bush out. Do not let the pots dry out, they should be kept moist but not soaking. They will be ready for planting in spring. Do not be disheartened at failures - not all of there cuttings will take. Keep trying. I find Salvias and Rosemaries are usually very successful. When should a particular shrub, rose, climber, ornamental tree or fruit tree be pruned? 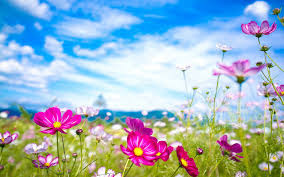 Below are lists of the most common plants divided into 4 seasons: spring, summer, autumn and winter, then into categories. 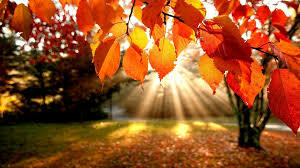 Each season has info on shrubs, roses, climbers, trees and fruit trees, all in alphabetical order. For instance if you want to prune a modern climbing rose, quickly scan through the seasons, you'll find it under 'roses' in autumn. Abelia – remove dead and damaged growth. Aloysia triphylla (Lemon Verbena) – prune mid spring after any danger of frost has passed to a woody framework , shorten growth to buds 5-10 cm from the old wood. Artemisia spp. 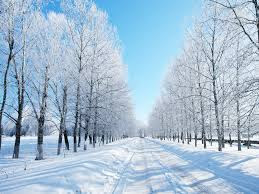 – cut back annually when main frost is over to a low framework of main stems. Bougainvillea spp. – prune back frost damage if grown as hedge to keep in form. Buddleja davidii – prune back to framework in early spring. Buddleja madagascariensis – from early to mid-spring, cut back shoots that have flowered to a bud or vigorous young shoot. Bupleurum – has no special needs, but tolerates pruning and makes a good informal hedge, trim in late spring. Mature specimens can be cut back hard if they become too dense and twiggy. Camellia japonica – only to tidy up, after flowering in spring, before buds brake. Carpenteria californica – prune after flowering, remove 1 in 3 branches from the base. Caryopteris – prune in mid - to late spring back to a framework, cutting to within 2.5cm of the older wood in mid to late spring, as the buds are breaking (when dead wood is more obvious), and when severe frosts are no longer expected. Cassia corymbosa – cut shrub back to 30cm. Ceanothus “Gloire de Versailles” – early to mid spring to a framework. Ceratostigma plumbagnoides – prune back to ground level in early spring. Choisya ternate – cut back flowered stems by 25-30cm. Cistus – prune shrub after flowering to a neat shape. Convolvulus cneorum – prune in early spring, before buds break. Cornus alba – in early spring, prune back to framework. Coronilla valentina - cut back after flowering. Cotinus coggygria – keep pruning to minimum, only diseased, dead or damaged wood or wayward branches. Cotoneaster – evergreen or semi-evergreen shrub or small tree; prune in winter or mid-spring. For a multi-stemmed shrub, develop a framework of 4 to 7 main branches, removing laterals crossing the centre of the shrub to reduce congestion. Thereafter keep pruning to a minimum. Daphne spp. – best left unpruned apart from dieback. Daphne does not respond well to pruning. Euonymus japonicus - tip prune mid to late spring. Exochorda – Prune out 1 in 3 old stems in late spring after flowering. Fatsia – prune mid spring, normally needs little pruning, remove unwanted branches completely. Forsythia – after flowering thin out crowded shoots from the centre of the shrub, cutting back a proportion of the oldest flowered wood to vigorous shoots. Fuchsia magellanica – early spring, once growth commences, cut back to lowest bud. Hebe cupressoides – prune in spring, trim back lightly into neat compact shape each year. Hebe pinguifolia – mid to late spring cut out growth that has been damaged during the winter and any stems that have died back. Hebe speciosa – trim lightly in mid to late spring as plant begins to make active growth. The same for Hebe ‘Great Orme’. Helichrysum italicum – in spring cut back leggy shoots to old wood. Helichrysum petiolare – pinch back long growths in spring to encourage bushiness throughout the growing season. Heteromeles – thin twiggy growth lightly and, if necessary to shape or restrict size, cut branches back to suitably placed laterals. Hibiscus rosa sinensis – prune in March by 1/3, leave 2 buds at the base of each branch. Hibiscus syriacus – prune in late spring, on established plants pruning is best kept to a minimum, though any shoots that show sign of dieback should be cut back to live wood. Hydrangea macrophylla - prune in mid-spring, cut back weak, thin shoots and one or two of the oldest stems to the base of the plant. Prune the previous year’s flowered branches by up to 30cm. Hydrangea paniculata – in early spring, before plants start into active growth prune back annually to a woody framework. Hypericum calycinum – in early spring cut back all previous year’s growth. Hypericum forrestii – in spring remove any old, weak or thin growth, then shorten the remaining stems back to the base or to strong shoots to keep growth compact. Most other Hypericums are treated like H. forrestii. Indigofera – prune early to mid spring, remove all weak shoots and cut back all others to just above ground level. Iochroma spp. – cut shrub back by ½ in March. Jasminum officinalis “Grandiflorum” – early spring by ¼ - 1/3 of the branches, every 4-5 years cut back severely by ¾.
Kerria – prune in late spring after flowering , cut the stem back to different heights. If plants are spreading too widely, chop peripheral canes out with a spade. Lavandula stoechas +Lavandula dentata – prune by ± 10cm after flowering. Laurus nobilis (Bayleaf) – Lightly prune between March - September to keep in form. Lavatera – prune in spring, when the buds begin to break, and after last severe frosts. Cut out weak growths and prune all other stems to within 30cm. In exposed positions, shorten stems in autumn. Leptospermun scoparium – Prune frost damage, prune lightly after flowering. Lespedeza – cut down old stems when danger of frost has passed. Lonicera fragrantissima – in late spring cut old and weak stems back to the base of the plant to encourage growth low down that will keep the base well furnished. Shorten up to one in three of the other branches, cutting them back to just above fresh, upright shoots. Mahonia aquifolium – prune in spring after flowering. Remove unwanted suckers. Shear ground cover plants to just above ground level annually or every 2 years , to keep them thick. Taller growing specimens need little pruning. Mahonia x media – in spring after flowering. No regular pruning is required but long or old stems that are bare at the base can be cut back to strong growth lower down. Myrtis communis (Myrtle) – prune lightly to maintain shape in late spring. Nandina – pruning is only needed to keep the plant tidy. Nerium oleander (Oleander) – after frost has passed, aerate centre, cut back branches by 1/3. Osmanthus delavayi – prune in late spring, after flowering. Hedges may be clipped over several times during summer, but in cool climates do not trim them any later than midsummer, or the resulting fresh growth may be vulnerable to frost damage in winter. Penstemon – prune in spring after any danger of severe frost has passed. 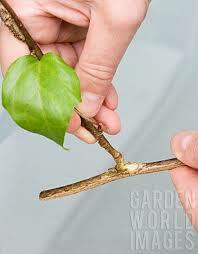 Prune any winter-damaged stems back hard to encourage fresh growth from the base. Perovskia – prune in mid-spring, as new growth is breaking. Prune each year back to a framework of old wood that will gradually develop. Phlomis – prune in mid-spring when the shrub is in active growth. Established plants need no annual pruning, but benefit from occasional shaping cuts. Shorten any frost-damaged stems, cutting to just above healthy buds. Cut out any weak and old shoots entirely. Phormium – in late spring prune the dead or damaged leaves. Photinia x fraseri – prune in spring, to encourage more bright young leaves, when established, shorten stems by up to 15cm, cutting just above an outward facing bud. Clip hedges two or three times a year. Phygelius – prune in spring, after the danger of frost has passed. Cut back all frosted stems to healthy buds on live growth, or to the base of the plant. Pittosporum spp. – prune in mid-spring to keep in form when growth has started. Trim hedges again in midsummer. Potentilla – prune in mid-spring, shorten vigorous young shoots by up to half. To tidy plants, trim over lightly after flowering. Pyracantha – prune in mid-spring, specimen shrubs need little training once established. On wall-trained specimens, cut back outward-growing shoots and shorten other shoots in spring. Hedges can be pruned in spring. Rhus typhina (Staghorn sumach) – prune in early spring, remove unwanted suckers as they appear. Cut back plants grown for foliage effect either to about 10cm from the ground or to a low framework of woody stems each year. Rosmarinus (Rosemary) - formal hedges should be trimmed twice in the season, in late spring and late summer. Salvia spp (Sage) - With garden salvias, pruning is the key to maintaining their vigour and promoting an attractive, compact habit. Unless you’re collecting seed, remove spent flower spikes from herbaceous varieties to stimulate a second and even third flush of blooms. When pruning woody-stemmed varieties, there is just one thing to remember, cut plants back very hard, but never prune to bare wood. Many growers recommend that you wait until you see new shoots emerging from near the base of the plant before you cut. Hold back even longer in frost prone areas - the old stems will protect the fresh growth. Pruning is generally done after flowering, but this can be difficult when some varieties flower almost continuously! In this case, watch for that new growth, and prune then. Santolina – in early spring, every two to three years, as plants become more open and straggly, cut hard back into old wood. Solanum spp. – prune beginning of spring, aerate the centre, reduce branches by ½.
Spartium junceum (Spanish Broom) – in early spring, in the first two years, cut back the main stems by half to promote a dense habit. Subsequently every two or three years reduce the previous season’s growth to within 2.5 cm of the old wood. Spirea douglash – prune in early spring, shorten 1 in 3 or 4 of the remaining stems to within 2 to 4 buds of the previous year’s growth; remove some stems entirely to maintain an open habit. Spirea japonica – prune in early spring, cut out all weak and old wood, prune back remaining stems to leave a framework 10-15 cm high, and prune to 1 or 2 buds of this every year. Tamarix (Tamarisk) – prune late summer flowering tamarisk in spring. In the first two years cut back stems by 1/2, prune established plants annually, cutting back flowered stems to strong sideshoots. Ulex europaeus (Gorse) – in late spring after flowering clip over lightly after flowering to keep growth compact. Shorten wayward stems, if necessary. Viburnum x bodnantense – prune in early spring after flowering. On established bushes, cut out up to 1 in 5 branches to the base, removing the oldest and the weakest. Leave the remainder unpruned. Vitex spp – in spring, prune flowered shoots back to spurs or young shoots on the main stems and remove 1 in 2 old stems completely. Remove any shoots that are dead, diseased or damaged, and cut back to healthy wood. Position cuts to encourage outward growth that will not cross the centre or other stems. Shorten the remaining stems to 20-22cm above ground level, making an angled cut to 5mm (1/2 inch) of an outward facing bud. Shorten stems to 25-30cm above ground level. 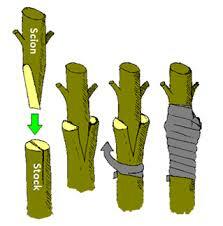 Shorten any laterals back to 2 or 3 buds from the main stem cutting to an outward facing bud. They are pruned the same way as cluster flowered bushroses. Remove any shoots that are dead, diseased or damaged. Relieve congestion by cutting out the oldest stems entirely. Tip prune main stems to remove any leftover flowers. Prune any laterals back to within 1 or 2 buds of the main stem. When growth becomes crowded, remove 1 or 2 old unproductive stems at the base. To maintain a compact habit and encourage flowering, tip prune a proportion of sideshoots at the periphery of the plant. Remove any dead, diseased or damaged growth, cutting to a healthy bud. Cut out any dead, diseased or damaged growth, cutting to a healthy bud. Tip prune main stems – or shorten them if they extend over their intended boundary. Ground cover roses (Creeping rambler type) – lightly prune in early spring. Gallicas – in spring take out all dead, diseased or damaged wood. Create a balanced open head to encourage vigorous new flowering growth. Remove dead, diseased and damaged growth. After pruning main stems have been cut back to about 20cm from the graft union and side shoots to 2 or 3 buds. Are best left unpruned on planting for their first couple of years to develop their form. Prune only to remove dead, damaged or diseased wood or to shorten weak spindly shoots to a strong bud encouraging fresh vigorous shoots. Once established prune according to rose type (rambler in autumn, climber in winter or ground cover rose (spring). Weeping standards come in different type of roses. Only ramblers with their long flexible shoots will weep naturally. Prune in late spring, after flowering, cut young plants back to strong buds about 30-40cm above ground level to encourage basal growth. Select five to seven strong shoots, tying in as growth proceeds. In the second season, cut back strong laterals by 2/3 of their length, and weaker shoots to 1 or 2 buds. Once established, to keep within bounds, shorten laterals by 1/3 to ½ of its length, cutting back to a healthy bud. After planting select 2 to 3 strong shoots as the main framework stems and tie in. In subsequent springs, before growth begins, shorten the previous season’s lateral by up to 2/3, cutting to a strong, well placed shoot. Prune early spring just before growth starts, prune back new plants hard to stimulate strong growth from the base, then tie in shoots as growth proceeds. Tie in only the strongest shoots, removing others. In subsequent years, reduce leading shoots by 2/3 to ¾ of the previous season’s growth, cutting back to a strong bud. Cut back laterals and sideshoots that are not needed to tie in to extend the framework to within 2 or 3 buds of the main stems; the shoots that develop will bear the current year’s flowers. Prune in early spring. After planting, prune all stems back hard to about 15cm. Select 2 or 3 of the strongest shoots and remove the rest. Tie in as growth proceeds, until shoots extend fully over the allotted space. Once established prune the plant annually, prune all lateral shoots back to within 2 or 3 buds of the main stems. Prune early spring before new growth begins. These large-flowered, decidious hybrids have two flushes of flowers, first in early summer on the previous year’s wood, then in late summer on new shoots. With careful pruning, the two can virtually overlap, providing a long, uninterrupted flowering season. Leaving an evenly spaced framework of strong growth, cut back all other stems to a pair of healthy buds. These should produce flowering shoots. Staggering the pruning, cutting back some shoots to healthy buds later than others, prolongs flowering still further. Prune back in early spring, when buds show signs of growth. Cut back to strong pairs of buds about 15-30cm above ground level. If any main stems have been killed by frost, cut them right out; new ones will usually develop from ground level. Old and congested wood should be cut out in early spring, retain as much upper growth as possible. Old plants tolerate hard pruning; cut back hard in early spring to leave only the framework branches. The more vigorous species can be trimmed back with shears during the growing season. Prune in spring immediately after flowering. Create a framework of branches, cut back flowered shoots to within 2 or 3 pairs of buds of the main branch, leaving the framework intact. Prune in early spring. After planting cut young plants back up to 2/3 to encourage strong basal shoots. Select the best to form the framework. Tip back shoots when they have reached their required height, thin out congested growth and cut back over-long shoots to suitable buds. Prune in spring. All training methods should aim to develop a permanent framework to which flowered shoots can be pruned back. To fan-train on a wall, remove growing tips after planting to encourage branching from the base. Select three to five of the strongest resulting shoots and tie them in to develop a framework. 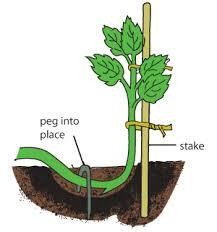 If training up and along high wires, train the single stem vertically, pinching back sideshoots until the plant reaches the height where laterals can be allowed to develop and be trained horizontally to form permanent main stems along the wires. Once established, prune in spring to remove dead, weak and overcrowded growth, and shorten shoots to keep within bounds. After flowering, cut back flowered shoots to within two or three buds of the framework branches. Prune in early spring. After planting remove the growing tips to encourage branching from the base, and select three or four strong shoots to form a framework. Once established, prune annually to remove unwanted growth, and cut back lateral shoots to within two or three buds of the main framework. Acacia spp (Mimosa)– prune after flowering. Remove faded flowers, normally they are pruned to a rounded or vase shape. Albizia - Just frost damage, A. julibrissin tolerates pruning to restrict size. Arbutus - Minimal pruning , just trunk clearance of branches. Catalpa bignonioides - prune out frost damaged growth in spring. Celtis australis (Australian nettle tree/Micocoulier) – remove dead wood and frost-damaged growth in late spring. Magnolia grandiflora – prune in spring as growths begins. In areas with long hot summers and mild winters, it forms a strong central leader and needs little pruning other than to shorten lanky young branches. There are 2 type of Fig Trees, one type of Fig tree fruits twice a year, the other type fruits once a year. Before pruning you need to know what type you have. 2 x a year fruiting Fig – prune the branches by 2/3 on ½ of the tree. 1 x a year fruiting Fig (fruits in autumn) – prune by 1/3 to 2/3 of all branches. Citrus – spring pruning gives re-growth time to ripen before the cold weather sets in. In general prune mature trees as lightly as possible. An exception can be made for some cultivars of lemon grown on a vigorous rootstock. On grafted citrus, suckers are likely to arise from below the bud union. 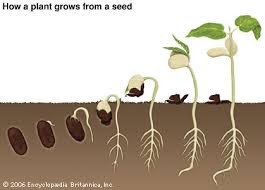 Inward-growing shoots should also be removed or cut back to an outward-facing bud since, shaded by other growth, they are unlikely to produce flowers. As with al fruit trees, diseased or dead branches should be regularly removed, and any crossing branches that could cause chafing damage. Olea europaea (Olive) – prune in spring when severe frost is over. Remove crossing branches and old and unproductive wood in order to stimulate new shoots that will flower the following year, and thin overcrowded growth in the centre of the crown to let in sun. Acca sellowiana (Feijoa) – no special needs; if necessary, prune ornamental Acca’s after flowering and fruiting Acca’s in winter. Abelia – prune after flowering, remove some old wood, cutting back 1 in 4 flowered stems to strong new shoots or to the ground. Callistemon citrinus - prune back by 1/3 after flowering in early summer. Ceanothus arboreus (evergreen variety) – prune after flowering, cut back longer flowered shoots by 1/3 to ½.
Ceasalpina gilliessi – After flowering cut back all branches by ½.
Chaenomeles – in early summer cut back all sideshoots to two or three leaves to improve flowering in late spring. Cornus mas – lightly prune in early summer. Deutzia – Prune back after flowering to young shoots below the flowered wood. Cut out old branches to ground level, or to strong low shoots. Cytisus battandieri – prune in summer after flowering. Requires little pruning, but old wood can be cut out. Elaeagnus angustifolia – prune in midsummer after flowering. Allow to develop naturally as a multi-stemmed bush. Elaeagnus x ebbingei – prune in late summer. Free standing specimens require only minimal pruning. To keep hedges in check, cut long shoots back to a bud with secateurs. Escallonia – prune after flowering by cutting out a proportion of the flowered wood. Euphorbia characias – midsummer after flowering, prune back flowered stem to a strong shoot. Fremontodendron – after flowering in midsummer, needs minimal pruning. Genista (Broom) – trim after flowering to keep plants bushy and compact. Grevillea – prune the branches in summer after flowering by ¾.
Hebe pinguifolia – Annual pruning is done in spring but in summer use shears to clip over plant to remove dead flowers. Helianthemum (Rock Rose) – prune lightly mid to late summer. Ilex – prune in late summer, when the new growth is ripe but not woody. Kalmia – requires very little pruning, just deadheading where this is practicable. Kolkwitzia – prune in midsummer after flowering, prune back 1 in 3 or 4 stems, always removing the oldest, either cutting to a low sideshoot or to the base. Lavandula angustifolia (Lavande) & Lavandula x intermedia (Lavandin) – after flowering to form a need rounded bush, don’t prune below new growth. Lonicera tatarica – in midsummer after flowering, cut old and weak stems back to the base of the plant to encourage growth low down that will keep the base well furnished. Shorten up to one in three of the other branches, cutting them back to just above fresh, upright shoots. Paeonia – prune in summer after flowering. Plant need little formative pruning. Remove dead flowers in summer. Occasionally cut old leggy stems of mature plants back to ground level. Penstemon – After flowering shorten flowered stems by half to prevent seed production and encourage further flowering. Cut any stems showing dieback right back to base. Philadelphus spp – Prune in summer after flowering. Cut back 1 in 4 stems, choosding the oldest, to ground level or to a low shoot. Pyracantha – in summer for wall-trained specimens cut back young shoots not needed for tying in to 2 or 3 leaves, to expose the next crop of ripening berries. Prune hedges for the 2nd time in summer. Rosmarinus (Rosemary) – prune in early summer, after flowering. Established plants needs little pruning except to cut lanky growth back to a main branch or shoot. Formal hedges should be trimmed twice in the season, in late spring and late summer. Rhamnus alaternus – needs very little pruning. Just damaged wood. Santolina – trim off faded flowers and long shoots annually in autumn. Spirea arguta (Bridal Wreath) – prune in early summer, thin growth by cutting back to ground level 1 in 4 of the oldest stems. Remove any weak growth, and shorten the flowered stems by up to 1/2, cutting back to strong shoots. Syringa meyeri – prune midsummer after flowering, bushes are naturally twiggy, and require minimal pruning. Syringa vulgaris – prune in midsummer, deadhead carefully, where practical, with secateurs to avoid damaging the young shoots which will flower every year. Remove suckers. They need minimal attention until stems become old and lanky, when they respond well to renovation. It is preferable to stagger hard pruning over two to three year. Cut back main stems to 30-60 cm from the ground. Tamarix (Tamarisk) – prune early flowering tamarisk in summer. In the first two years cut back stems by 1/2, prune established plants annually, cutting back flowered stems to strong sideshoots. Teucrium fruticans – prune early summer after flowering. They can be pruned very hard back or to a framework or to whatever height you require, if you leave them unpruned they become rather straggly. Thymus – prune after flowering, only prune to where you can see new shoots. Fresh growth will not break from old wood. Viburnum tinus – prune after flowering, keep pruning to a minimum, but remove any over-vigorous shoots that spoil the shape, cutting them back to well with within the plant’s outline to hide where the cuts have been made. Weigela florida – prune in midsummer, after flowering. When established, each year cut back flowered stems to strong, usually upright, shoots below the faded flowers. Cut out at the base 1 in 2 old stems, aiming to maintain a balance between mature and young wood, and remove or shorten overlong new growth that spoils the plant’s shape. Cut back old main stems by about 1/3. Reduce laterals by about 1/3 t a strong, healthy, outward facing shoot or bud. After mid-summer, when flowering is finished, prune back laterals to a main stem or to a shoot close to the main stem. Every 1 to 3 years, depending on vigour take out at or near ground level 1 or 2 old main stems. Prune in summer once single flush is over. Stems should be trained horizontally. They flower on wood produced the previous year. Ramblers make much more new growth from the base of the plant than climbers and this should be encouraged by cutting out 1 in 3 main stems to the base. 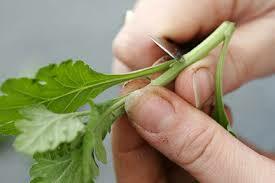 Remove the oldest stems, cutting them in several places and teasing small sections out. 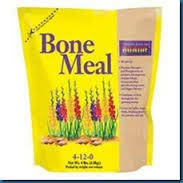 Feed well in spring. Prune ramblers on planting to stimulate growth from the base. Remove all dead, damaged and weak twiggy growth, cut main stem back to 40cm from the ground. Fan out the shoots and tie the stems in near to horizontal as they grow to cover the allotted space evenly. Once the allotted area is covered, thin and shorten excess growth after the flowering. Cut the oldest flowered stem back to just above the graft union. Prune other flowered stems to an outward growing replacement shoot. Prune any side shoots to 3 or 4 buds. Tip prune stems that touch the ground. Throughout the growing season remove as seen any suckers on the rose’s stem by pinching them out. Clematis Montana (group 1), prune immediately after flowering . Keep pruning of established plants to a minimum, cut back overlong shoots to healthy buds. Hardenbergia comptoniana – prune after flowering. Established plants need little pruning other than to remove overcrowded, weak, dead or damaged growth. They do not respond well to hard pruning. Hydrangea – prune after flowering. Pruning established plants is best kept to a minimum, but as plants fill their space, shorten overlong shoots and outward growing laterals by cutting them back to a healthy bud. Macfadyena (Cat’s Claw Creeper) – prune immediately after flowering to thin out congested growth and remove weak and damaged shoots. Wisteria – prune in mid-winter, and again in summer, about two months after flowering. There are 2 ways of training Wisteria over a pillar. If you wish the plants to flower on the pillars as well as over the top, then spiral the stems. If you want the canopy covered quickly then train them straight up. Once the stems have reached the tops of the posts, spread them evenly over the crossbeams, tying them into position. 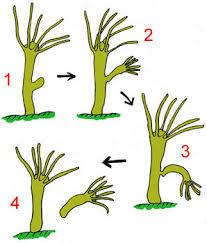 The aim of pruning a Wisteria is to control extensive growth and to encourage the production of lateral flowering spurs. The currant season’s shoots are cut back in two stages to within two or three buds of their base. These will bear the coming season’s flowers. Growth and flower buds are easily distinguished in late winter, the former being narrow and pointed, the latter plump and blunt. Established wisteria – in summer continue to tie in the main lateral growths and cut them back when allotted space has been covered. About two months after flowering, cut back laterals and sideshoots to within 5 or 6 buds, or 15cm , of a main branch. In winter cut back the laterals and sideshoots pruned in summer to within 2 or 3 buds of their base. These will bear the coming season’s flowers. Cercis siliquastrum (Judas Tree) – prune and remove any frost-damaged shoots in early summer. Laurus nobilis (Bay) – Clip or trim shaped plants in summer. Magnolia soulangeana – in midsummer, after light formative pruning little other pruning is needed, unless the brittle wood suffers wind damage. If possible remove flowers when faded. Sorbus spp. – remove dead wood in summer. Sophora – prune in summer. Need little pruning, just diseased, damaged and dead wood. Prunus armeniaca (Apricot) – after fruiting, cut back up to a ¼ of the fruited shoots to a new shoot. Leave those that have made plenty of fresh growth beyond the fruited portion, unless it spoils the shape of the tree: this growth will fruit well next year. On older trees cut back one or two branches or sections of branches each year to encourage new growth, otherwise fruiting will gradually become limited to the periphery of the tree. Prunus avium (Sweet Cherries) - prune only when necessary in mid-summer, shorten growth to stimulate fruiting and thin crowded growth, occasionally remove old growth in favour of young shoots. Prunus cerasus (Acid Cherry)– after fruiting, cut back up to a ¼ of the fruited shoots to a new shoot. Leave those that have made plenty of fresh growth beyond the fruited portion, unless it spoils the shape of the tree: this growth will fruit well next year. On older trees cut back one or two branches or sections of branches each year to encourage new growth, otherwise fruiting will gradually become limited to the periphery of the tree. Prunus domestica (Plum) – after fruiting, cut back up to a ¼ of the fruited shoots to a new shoot. Leave those that have made plenty of fresh growth beyond the fruited portion, unless it spoils the shape of the tree: this growth will fruit well next year. On older trees cut back one or two branches or sections of branches each year to encourage new growth, otherwise fruiting will gradually become limited to the periphery of the tree. Prunus dulcis (Almond) – prune only when necessary in mid-summer. Prunus persica (Peach) – prune annually in early summer. The aims are first to maintain a healthy, strong, open-centred bush, then to maximize fruiting potential by removing older wood in favour of new growth. Keep the crown as open as possible while retaining some new growth in the centre of the bush, so that branches bent down by crop weight can be shortened to an upward-pointing replacement shoot. Prunus persica var. nectarina – as for peach. Cestrum – end of October cut shrub back to 30cm. Lantana spp – end of autumn prune all branches by ½.
Lavatera spp – In exposed positions, shorten stems in autumn. Major pruning takes place in spring. Russelia equisetiformis – cut shrub back to 20 - 30cm in October. Streptosolen jamesonii – cut shrub back to 30cm in autumn, protect during winter (straw or fleece). Modern Climbers (repeat flowering) – the main aim when training climbers and ramblers against a flat surface is to train as much growth as near horizontal as possible. If the stems were allowed to grow directly upwards, they would only flower at the top. For awkward spaced where horizontal training is not possible, such as a narrow area between two windows, choose either a large shrub rose or a climbing rose suitable for pillars. It is preferable to prune them in autumn, but they can be pruned right up to spring. Plant rose 45cm from the wall. Stems should be tied to canes and the canes to the wire to guide stems to wall. Tie in new growth to build up a framework, training shoots near horizontal along the wires where possible. Remove any dead, diseased or damaged growth. Prune flowered shoots by 2/3 of their length, making an angled cut above a healthy shoot or bud. Cut out completely any unhealthy or spindly leafless growth. Check new growth to make sure it is tied in throughout the season. Reposition or shorten any shoots that have grown to rub against others. Where an old stem has become less productive, prune it back to a healthy shoot, tying this in. Shorten stems where they have overgrown the rose’s allotted space. Jasminum officinale – prune after flowering. Lead young shoots to the support, tying loosely at first. In subsequent years, prune to thin out overcrowded growth, removing weak shoots and cutting flowered shoots back to strong buds or to their bases. Eriobotrya japonica – prune after harvest the branches that have given fruit. Treat with Bouille Bordelaise at the end of winter. Acca sellowiana (Feijoa) – no special needs; if necessary, prune ornamentals after flowering in summer and fruiting plants in winter. Alyogine spp. (Blue Hibiscus) – prune shrub by ½ at the beginning of winter. Berberis thunbergii – prune in mid to late winter by cutting out 1 in 5 of the stems each year to base or to a strong shoot low down. Brugmansia (Datura) – Cut back to previous season’s growth to within 15cm of ground level or to framework stems in late winter before onset of growth. Chimonanthus praecox (Wintersweet) – keep pruning to a minimal, after flowering. Leonotis leonorus – in November cut shrub back to 20-30cm. 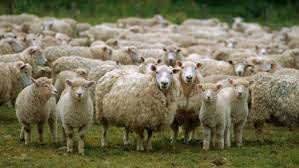 Protect in winter, (straw or fleece). Sambucus (Elder) – allow to grow unpruned for a season. Then cut down half the stems to ground level and shorten the remainder by half. Thereafter, shorten 1 year old wood by half and cut back older stems to the ground. Remove dead flowers and if necessary correct unbalanced shape. Cut weak stems back harder than those that grow strongly. Reduce laterals by about 1/3 to a strong, healthy, outward facing shoot or bud. Clip over lightly Gallicas grown as hedges. Mandevilla – prune in late winter or early spring, prune to thin out overcrowded growth and remove weak shoots. Tip-prune shoots that have filled their allotted space. Plumbago auriculata – prune in late winter. Once established, aim to maintain the primary branch framework, and spur-prune all laterals to within two or three buds of their base. Remove all weak or badly placed shoots completely, cutting back to a main framework branch. Vitis (Vines) – prune in mid-winter before the sap begins to rise. After planting, pinch out the growing tip and select two or three of the resulting strong shoots to form the primary framework. Over the next two to three years continue tying in shoots as growth proceeds, aiming to extend the main framework to cover the allotted space. 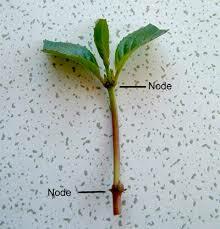 Once the framework is established, shorten all laterals to within two or three buds of the main branches. Excessive growth of lateral shoots can be trimmed back to a strong bud during the summer. There are 2 ways of training Wisteria over a pillar. If you wish the plants to flower on the pillars as well as over the top, then spiral the stems. If you want the canopy covered quickly then train them straight up. Once the stems have reached the tops of the posts, spread them evenly over the crossbeams, tying them into position. Established Wisteria – in winter cut back the laterals and sideshoots pruned in summer to within 2 or 3 buds of their base. These will bear the coming season’s flowers. Ailanthus altissima – roots tend to spread, prune in winter to clear trunk, rest of the tree leave pruning to minimum. Catalpa bignonioides – between autumn and late winter. Established trees need little pruning, although heavy branches may need shortening or removal to balance the framework. Celtis australis (Australian nettle tree/Micocoulier) – prune in winter, in general they need little pruning. Ceratonia (Carob Tree) – prune from winter to early spring to form a multi-stemmed tree on 60-90 cm trunk. Young tree tolerate shaping cuts if growth is uneven and straggly; remove branch leaders and shorten sideshoots to make a more compact, bushy crown. Mature trees tolerate trimming to restrict their size, but do not remove too much growth in any one year. Melia azedarach (Indian Bean Tree) – prune from autumn to early spring. Clearing the trunk in the early years encourages closer branching higher on the trunk. Sorbus – prune in winter. Cydonia oblonga (Quince) – as the tree matures, growth will become untidy and crowded; vigorous shoots can be shortened to prevent congestion building up, or more informal regulated pruning, removing some older wood, can be used to relieve congestion and keep the centre of the bush open. Never prune too hard in any one year, or vigours regrowth will be stimulated . Suckers from the base or on the clear trunk should be removed. Diospyros (Persimmon/Kaki Tree) – they often produce an abundance of twiggy growth, if the centre of the tree becomes crowded, it may be thinned winter to promote air circulation and to let more sunlight reach the fruits. Malus domestica (Apple Tree) – prune in winter. Mespilus germanica – once a strong, well-spaced branch framework has been established, however, only minimal pruning is required thereafter, removing a small proportion of older fruited wood in winter if growth is overcrowded. Morus spp. (Mulberry) – prune from early to mid winter. Punica granatum (Pomegranate) – annual pruning is mainly confined to shortening a small proportion of older branches to encourage the development of new shoots. Pomegranates have a strong tendency to sucker at the base of the stem; remove as seen. Pyrus communis (Pear Tree) – prune in winter. Zizyphus jujuba (Jujuba Tree) – prune in winter, remove dead and damaged wood and prune tree to the desired shape and size. Pruning for better fruiting is not necessary.